The Sentinel Convoy Pen got announced and we've been hearing a lot about it real quick. On the heal of this mornings earlier story, we now have larger pics of all 3 pens (Prime, Magnus Cab, Black Prime). On top of that, the Ultra Magnus version will be an exclusive to site sponsor Hobby Link Japan. The other 2 are not exclusive to them, but are available from them as well here. Prime is due out in September, and the other 2 in October, ranging from 35 - 40 bucks. Check out the updated pics after the break, and head on over to HLJ to grab your Ultra Magnus! Amazon have updated their website with some official images of the upcoming Lost Age Battle Command Optimus Prime. A Japanese market exclusive, this toy boasts lights and sounds and can transform in just four steps. The images reveal a new feature - the trailer can transform into a battle station for the one-step changer and Power Attacker toys. It's due for a release in July 2014. Ameblo.jp has updated their website with new images and details of the Sentinel transforming Optimus Prime pen, evidently it is officially being called "Convoy Pen". The figure is set to retail for 3,980 yen and is due for a September 2014 release. The listings are accompanied by new images showing Convoy Pen in color. But that is not all because two redecos have also been announced - a Black Convoy Pen and an Ultra Magnus Pen, black Decepticon and white "naked" Ultra Magnus colors versions respectively. Each of those looks very sharp, and they are reported to be due in October 2014. Colored images of all three toys are shown, but we think they might be photoshop colors, so be warned the final colors may vary. They popped up on Hasbro Toy Shop on Cybertron Monday, but today, the Generations Age of Extinction Voyagers Hound and Galvatron have also been seen on US store shelves! Both were spotted on shelves at the Toys R Us in Clifton Park NY by the awesomely named CtPoopenstein of our 2005 Boards. Don't forget you can keep up to date with the latest sightings in your area in our Transformers sightings section! Happy hunting, one and all. Via Quincy Ho at Transformers Colombia, we can share with you some images of the Transformers 30th Anniversary Expo, taking place now in Macao. The event is running between June 1 and 5 October 2014 at The Venetian Macao - check out our previous coverage for full details. What we have here for you are some pictures of the displays themselves - which include large statues of Optimus Prime, Bumblebee, and even that infamous duo of Skids and Mudflap. There also seems to be a Matrix prop replica on show, and some very cool Autobot and Decepticon symbols. Check out the images, and a big thanks to Quincy Ho for sharing them with the fan community. The Retro and Relevant Toy Show is underway in Vancouver - and Renderform are in attendance to show off some of their upcoming projects. In addition to their Death Czar kit to turn Predacons Rising Darksteel into Deathsaurus they are also showing off some cool other pieces including some alternate heads for the upcoming Mech Ideas Gauntlet / Ironfist, a painted version of the Overload-inspired head for FansProject Steel Core and a lion-themed sword and shield weapon set, intended for Transformers Prime Thundertron or rather, his Leo Prime redecos. Big thanks to daimchoc and Carissa Dutton for passing these along to us. Transformers to feature in June 2014 Loot Crate! Loot Crate, the monthly pop-culture subscription service that has $40+ of merchandise in every month's crate, has announced its June 2014 theme - Transform! Loot Crate has teased the June 2014 crate as "... more than meets the eye. Whether you’re a Looterbot or Decepticrate, this month’s crate includes an epic t-shirt, items that transform, and more!" Moreover one lucky subscriber each month gets a special Mega Crate, and for June 2014, the crate contains the gigantic SDCC version of the Generations Metroplex! The official Transformers Facebook page has updated with an official picture of the Grimlock Unleashed Kre-O set. This Toys R Us exclusive was revealed to us when it was released at retail in CA just a few days ago - it includes a Generation 1 Grimlock Kreon with crown alongside a large buildable Grimlock dino! The set also includes a quartet of Movie themed Kreons - Optimus Prime, Galvatron, Lockdown and Bumblebee. Check out the image at left. Good morning from Japan, everybody. Don't be surprised… It's "Battle Cry Monday" already. As previously announced, Transformers: Age Of Extinction Theme Song; Battle Cry by Imagine Dragons will release on Monday 2nd of June, 2014. That day has arrived for some countries. You can now purchase the song via iTunes Japan. Imagine Dragons wrote the original main theme of the film which the film director Michael Bay used in critical points in the film. Additionally, the band contributed original music during the scoring process by recording cues with Steve Jablonsky, the film's composer and Hans Zimmer, who assisted in the process. Don’t forget to tune into TFW2005 for "Trailer Tuesday". June has arrived. We are only 27 Days away from the release of Transformers: Age Of Extinction (for some it’s just 25 Days). Our good friend Nelson; the Admin of Michael Bay's Official Website has revealed the running time of Transformers 4. The movie will run for 2 Hours & 30 Minutes (excluding the Credits). "#transformers4 running time: 2 hrs 30 mins (without credits) #tf4 #Transformers #AgeOfExtinction"
If we speculate that Credits will run for more than 4 minutes, TF4 will become the longest running Transformers Live Action Movie so far. Marketing Campaign for the movie is in full swing and already there is another new TV Spot being shown in various countries. And tomorrow (2nd of June) the Official Theme Song of the movie "1Battle Cry" by Imagine Dragons will debut. Furthermore, a new trailer with a running time of 1 and a half minutes is set to release on June 3rd. As suggested earlier, we have confirmation that the first of the seven new Transformers Collectors Club Figure Subscription Service toys have begun to arrive with fans! The first of the seven to arrive is Barricade, the Decepticon enforcer who transforms into a police car. He is a redeco of the Transformers Prime Beast Hunters Prowl - so he should look right at home with your Transformers Prime toys. Big thanks go to PoweredConvoy for the initial heads-up and to IceCreamCyborg for sharing these pics with us. Also being found on shelves now is the 12 inch Transformers: Age of Extinction Titan Silver Knight Optimus Prime. This figure, a Target exclusive like almost every other iteration of the Silver Knight, is a rather shiny silver unlike the dull grey of some of the other releases. It's non-transforming and low poseability though, so it may not be for everyone. Big thanks to 2005 Boards member almightymaximus who spotted this one at a Target store in Connecticut. 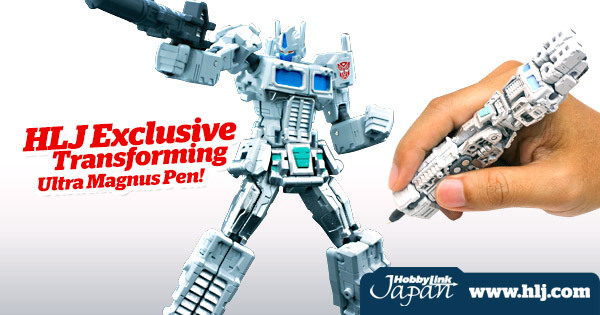 Via the Supreme Mecha blog, we can share with you this new image of the Sentinel Optimus Prime transforming pen. This cool little oddity transforms from a working - if extremely cumbersome looking - pen into a fully poseable little Optimus Prime robot. This new scan shows off a couple of the poses the robot can be put in, and also shows off just how spot-on the robot mode is looking. Check out the new image at left. Good news, fellow fans! The TCC's exclusive Transmutate (or Trans-mutate, as she is named on the packaging) is now arriving. A redeco of Transformers Prime First Edition Arcee, Transmutate represents the tragic, tortured character from the Beast Wars episode of the same name. Her box includes an extra space in its foam tray for the upcoming membership exclusive figure, Rampage. Big thanks go to Rodimus13 for the news tip, and to Thundershot for sending some in-hand pics our way including a comparison with the Beast Wars 10th Anniversary build-a-bot, demonstrating how well the mold choice and deco really nails the look of Transmutate. We have some more new Transformers sightings to share with you! Some new Transformers: Age of Extinction Flip & Change toys have been sighted on store shelves. The Flip & Change Lockdown has begun to appear at Target stores in El Cajon, CA (near San Diego) and has also been spotted in stores near Durham, NC. That's not all, though, because the El Cajon Target also had the Smash & Change Silver Knight Optimus Prime - one of the Target exclusive items for this movie line. He's a largely grey version of Optimus Prime. Happy hunting, one and all! Big thanks to joeluna33 and Daimchoc of our 2005 Boards for the sightings tips. Barnes and Noble will be offering an exclusive metallic version of the Pop Vinyl Optimus Prime figure, we have learned. The initial reveal went online last week but has since been taken off of the Barnes and Noble site, although you can view it using Google's cache. Pop Vinyls has since updated with an image of the exclusive metallic Optimus Prime - check out the image at left. Many thanks to long-time 2005 Boards member alphie for the news tip. 2005 Boards member TFConvoy has tipped us off to a special Transformers 30th anniversary expo running in Macau, at The Venetian Macao. It's a special display showing 1,000 toys and other pieces of merchandise along with two-metre tall holograms. The event runs from June 1 all the way through to 5 October 2014, so there is plenty of time to check the event out - The Venetian is even offering a special hotel package including tickets to the expo. It sounds like a great event to visit - and lest we forget, many of the original Transformers were also manufactured in Macau, so there is also a great connection between the brand and Macau which makes this celebration expo all the more poignant. As a part of Botcon's 30th anniversary of Transformers celebrations Universal Studios Hollywood are having a special "Fan Experience" which includes exclusive after-hours access to Transformers the Ride along with other park rides and attractions, plus panels with the Hasbro Transformers team, a limited edition poster, and - as the title line says - a private concert with the one and only Stan Bush! Don't miss this opportunity to hear Stan perform live, which we bet will include "The Touch" and "Dare" from Transformers the Movie! Those attending Botcon should have a ticket with their attending package - but for everyone else, you can also buy tickets at ushtix.com/transformers. Third party group Toyworld, has finally provided fans of their T-Series (aka G1 Throttlebots) with an update. Seen on their website is a group shot of the three previously released figures with the prototypes of the next two in vehicle mode. Shown alongside Trace, Aurora and Grind Rod are unofficial versions of Freeway and Wideload. Both characters are receiving modern alternate modes in the forms of a Mini Cooper Sport Coupe and a Conquest Knight XV. No robots mode images just yet. What is interesting about this update is that originally when Grind Rod was released, a teaser showed five figures total. Later, when Trace and Aurora released, the teaser image was updated to include six figures. The sixth, presumably being Goldbug, is now left out once again. These figures are still rumored to be able to combine. So will we be seeing a five figure Throttlebot combiner? Or is Toyworld holding back on the most famous and recognizable Throttlebot for a final release? Speculate and discuss on the 2005 Boards after the jump!